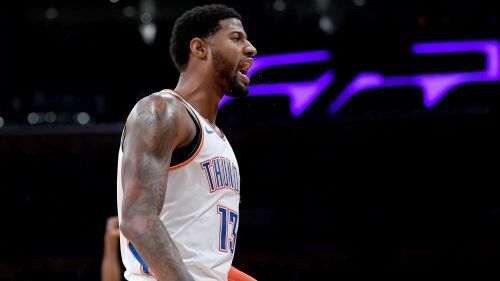 Paul George ignored boos in the Staples Center, scoring 37 points for the Oklahoma City Thunder in a 107-100 victory over the Los Angeles Lakers. George, who spurned the Lakers in free agency, had plenty of highlights to quieten the crowd on Wednesday. Thunder star Russell Westbrook had a triple-double (14 points, 16 rebounds and 10 assists), but had a terrible shooting game, hitting just three of 20 attempts. A few players stepped up in LeBron James' absence, but the Lakers fell short. They are now 1-3 with James sidelined by a groin injury. He is considered day-to-day. Kyle Kuzma has been the Lakers' second-leading scorer this season, but he left with a lower-back contusion. Kentavious Caldwell-Pope ended up leading the way for Los Angeles, scoring 25 points on six-of-14 shooting. Brandon Ingram and JaVale McGee scored 17 and 15 points respectively. The Lakers dropped to 21-17, while the Thunder improved to 24-13 this season. Anthony Davis had an impressive 34 points and 26 rebounds as New Orleans fell to Brooklyn 126-121. Jaren Jackson Jr. was very efficient, scoring 26 points on eight-of-11 shooting while grabbing 10 rebounds in the Grizzlies' 101-94 loss to the Pistons. Justin Holiday scored three points and only made one of his seven shots from the field as the Bulls lost to the Magic 112-84. Devonte' Graham scored 10 points on three-of-13 shooting in the Hornets' 122-84 routing at the hands of the Mavericks. Although Minnesota fell short to the Celtics, Karl-Anthony Towns was happy to punch a dunk home on Semi Ojeleye. Stephen Curry was out of commission in this season's first matchup with Houston. The Rockets are on a tremendous run and James Harden is catching fire every game. Although Chris Paul is out, the Rockets may be able to will themselves to another victory against the reigning champions.